Have you tried the Copernic Desktop Search before? If yes, please consider recommending it by clicking the Facebook "Recommend" button! This download is 100% clean of viruses. It was tested with 23 different antivirus and anti-malware programs and was clean 100% of the time. View the full Copernic Desktop Search virus and malware test. The file that was tested: copernicdesktopsearch.exe. Tip: If you're experiencing trouble downloading this file, please disable any download managers to Copernic Desktop Search you may be using. If you're receiving a 404 File Not Found error, this means the publisher has taken the file offline and has not updated their links with us for Copernic Desktop Search. Please do drop us a note in the event of a missing file. Copernic Technologies provides their software as a Windows Executable file and therefore installation is as easy as downloading the file copernicdesktopsearch.exe and running it directly after retrieving it. We highly suggest using antivirus software before running *any* files from the Internet. The company hosting this file has a trust rating of 9/10. 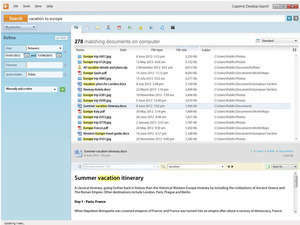 File Search - Search the contents of documents on your computer. File Search - Quick and convenient way to find files on your computer. File Search - Alternative to the standard "Search For Files And Folders" module of Windows. File Search - Search files/folders in various formats on local drives and removable drives. File Search - A different approach to manage files. Organize you files by extension. File Search - It is a file viewer, finder and editor with text tools.